FIFA 17 will be hitting the shelves by end of the september 2016 while the demo will be officially released on 13th September 2016 on Xbox One and PS4. However during the gamescom gaming convention in Europe EA Sports let visitors play FIFA 17 at their booth and we have our official FIFA 17 ratings from there. As far as the highest rated players are concerned, Lionel Messi still reigns with 94 overall ratings closely followed by Cristiano Ronaldo who is 93. Neymar, Neuer and De Gea are the only other players to have more than 90 rating they will be 91 overall. There are several players rated 90 which include the likes of Manuel Neuer, Zlatan Ibrahimovic and Luis Suarez of Barcelona. 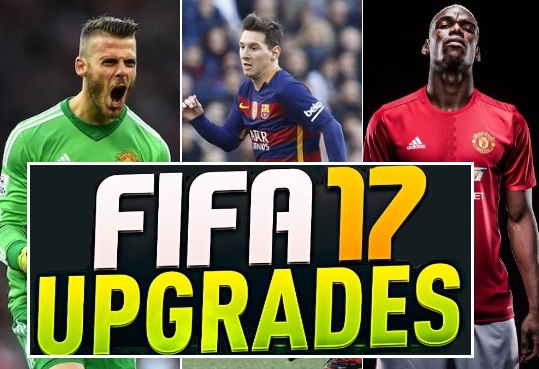 We take a look at each of the top teams if FIFA and their lineups and ratings. De Gea is the highest rated Manchester United player with 91 overall rating. While Anthony Martial has got steady increase to 82 and him being the fastest player in United ranks. Interestingly enough record signing Paul Pogba is just 87 overall rated while Bastian Schweinsteiger is still 86. As expected, Barcelona has the best ratings in the game with Messi (94), Neymar (91) and Suarez (90). So much pace and skills upfront it will take some stopping this Barcelona side in the game. Real Madrid keep their ratings from 2016 and they are one of the fast teams in the game with Ronaldo, Bale and Benzema bulling defenders. Juventus has spent their Pogba money wisely, Bringing in several top class players including Napoli’s Higuain and Roma’s Pijanic. Thats how their ratings looks in FIFA 17. Pep Guardiola’s Man City is probably the most balance premier league side. Pacey forwards, powerful midfield and a solid back four. After terrible 2015-16 not much was expected as far as Chelsea ratings were concerned. A very solid all around team with slight disadvantage as far as their defense is concerned. Klopp has put together a decent squad and this Liverpool side has alot of pace and skill upfront with Mane, Firmino, Sturridge and Coutinho all getting slight increases. Last season’s best premier league side, Tottenham also got some ratings increase but not enough to make them stand out. Having won the Premier league title one would have though Leicester players to get decent increases but they remain more a less same at high 70s with the exception of Vardy and Mahrez who are 80 and 83 respectively. Which fanboy edited rooney to 86 and mkhitaryan to 87?